Words can not fully express the incredible experience I had in Portland, Oregon these past three days. This was the most full-filling site investigation I have ever experienced! I was able to do some incredible site seeing in this breathtaking state and visit three schools, thanks to my new partners. I was invited to join Partners Oregon-Costa Rica this past summer by Don Ruff, president. He and his wife agreed to host me in their home for three days. Don introduced me to Marilyn McDonald, a supporting chapter member and retired school teacher, who showed me we can indeed be limitless if we have a passion for kids! Marilyn took me to three different schools. The first was to visit Lisa McDonald, principle at the Wilkes School and her daughter in law. Next we visited Marilyn’s son Travis McDonald at the Trout Dale Elementary School, where we discussed training and teaching Kids Share at the same time I am in Costa Rica next winter. Travis seemed very interested in leading the enrichment program with his students. And lastly we visited the Bienestar Housing Community School in Hillsboro, Oregon. 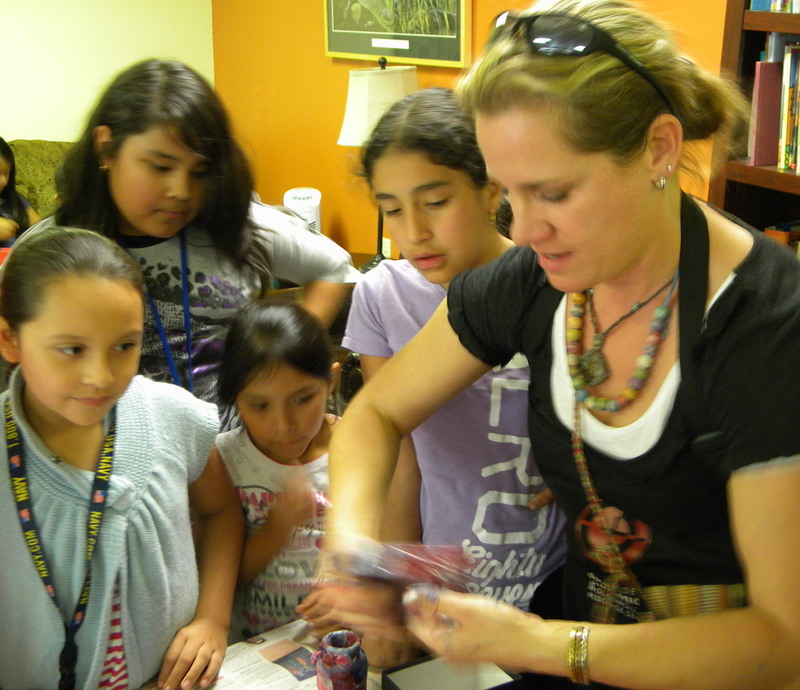 I was told upon arriving to Oregon that the Bienestar After School Program, which is a migrant community from Latin America, was hoping I would not only give a presentation and teach the children how to create tissue art then apply it to recycled material, for gift ideas and fundraising. I was unprepared for this sudden schedule changed but excited and up for the challenge! Marilyn and I manage to walk into a local hardware store the day before I was to teach and receive almost $300 worth of art supplies to teach. Without hesitation one of the Ace managers gave us everything we needed! The children and volunteer adults loved the 2 hour workshop which did result in decorating a watch box and small vase. The children marveled as I poured Elmore’s glue all over the palm of my hand and rubbed it on the recycled containers. I then applied the tissue art and even showed them how to make tissue art flowers. It was super fun and useful for these kids to learn. Beinestar has a strong need to teach kids how to create fundraising crafts. I could go on and on; telling you how exciting the last three days was in this very first blog posting, but I feel the slideshow below will show you just that. I am up late putting this all together before I head to Costa Rica tomorrow, very early. But before I leave this beautiful and friendly state, I want to THANK Don Ruff, his wife, the teachers, volunteers, principles and especially Marilyn McDonald who took me to all the schools, mentored me and volunteered many hours with me. I am off to a wonderful start with my new friends and partners at Partners of the Americas! Please follow me to Costa Rica, Oregon’s sister country, where I will be posting the next site investigation!